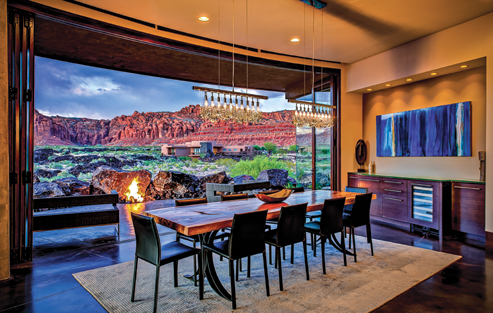 A crayon sketch may be an unconventional—some might say colorful—way to communicate the vision of one’s dream home, but for Chris and Rhondi Peters, it was the successful starting point of their stunning Entrada home in St. George. “We had looked for the right site for years and had a good idea of the floor plan and layout throughout the house,” explains Rhondi. “But in our first meeting with the architect, we had our daughters with us and used their crayons to draw the basic design.” Of course, the rough draft had to be tweaked a bit, but thanks to the Peters’ clarity and the bold design of McQuay Architects’ principal architect Rob McQuay, the finished project closely resembles the original Crayola-captured vision. As their second home, the Peters wanted this family retreat to accommodate their active, outdoor lifestyle. And, with three huge dogs and three young children, they didn’t want anything fussy or high maintenance. “Our idea was that the more fun and attractive we made it for the kids, the more psyched they will be to come on long weekend getaways—and bring their friends,” says Chris. The Peters’ love for contemporary design inspired the dwelling’s simple, clean lines, to which they added elements making it inviting for friends and family. The 4,435-square-foot home and guest casita are designed on a radius and feature sweeping roof lines, curved walls and a round interior space that incorporates the dining room, great room and kitchen. The four rectangular bedrooms and bathrooms connect the curves. “My husband loves the flow that curved spaces create,” explains Rhondi. The couple worked with interior designer Michele King, principal of King Design Group, for more than a year to find just the right cabinets, tiles, countertops, carpet and furniture pieces to accent those curves, including a crescent leather sofa for the great room. The result is an “elegant, well-placed home that blends in with the landscape and reflects who they are,” says King. Framing those panoramic views informed every aspect of the design. “We let the house respond to the landscape,” explains McQuay. “The home is designed to maximize outdoor living space, so it feels much larger than it really is, and they can use it year-round.” A simple formula for materials—steel, glass and concrete—and a clean color palette of monotone gray with splashes of bold color keeps the focus on design and site. To create a seamless indoor/outdoor experience, diamond-polished slate gray concrete flooring flows from the main interior space to the generously sized patios. Massive, sweeping panels of glass are custom built into bi-fold doors that open and fold accordion-style to disappear against the walls. Each bedroom has a private patio, and the infinity-edge swimming pool flows into the lava cliffs on the site. At the center of the home, a symmetrical kitchen is framed by concrete fin walls and provides views from the great room through to the dining room, patio and natural vistas beyond. Contemporary and cutting-edge, this home prevails and showcases what can come from an imaginative team’s talents when paired with a clear and creative vision—regardless of its colorful origin. Please follow the link to this story on the Utah Style web site: read story online. Utah Style is an invaluable resource for design professionals and homeowners alike to stay up to date with latest in interior design and architecture in the Utah area.